We aimed to study the effect of background noise on speech auditory evoked responses in both normal-hearing (NH) individuals and those with sensorineural hearing loss (SNHL) and correlate these neurophysiological results with subjective measures. Understanding speech in noisy situations is one of the most complex activities encountered in everyday life. It is dependent on cognitive factors and sound processing at peripheral, subcortical, and cortical levels. These make perception of speech in noise one of the most complex aspects of human communication. Fifty NH individuals and 40 individuals with mild-to-moderate SNHL were subjected to the Speech, Spatial, and Qualities of Hearing Scale questionnaire, the speech perception in noise test, speech auditory brainstem response, and cortical auditory evoked responses using speech syllable/da/in quiet condition and at three different signal-to-noise ratios (SNRs) (+10, 0, and − 10). Speech auditory brainstem response results in NH participants showed delayed latencies of both transients (waves V, A, C, and O) and frequency-following response with reduction in amplitudes of onset (V and A) and F wave only in noisy relative to quiet condition, whereas in SNHL delayed latencies and decreased amplitudes of both transients and fractional flow reserve (FFR) were observed. The effect of noise can be seen in all waves of cortical auditory evoked responses – that is, with decreasing SNR response, latency increased and response amplitude decreased in both SNHL and NH. Verbal communication under so-called cocktail party conditions is one of the most amazing abilities of the human auditory system. When we are confronted with more than one acoustic stimulus at once, it is necessary to perceptually segregate relevant auditory information from concurrent background sound and to focus auditory attention on the source of interest ,. Both behavioral and physiological measures have been used to understand the important factors that contribute to perception-in-noise abilities. The addition of a physiological measure provides additional information about signal-in-noise encoding in the auditory system and may be useful in clarifying some of the variability in perception-in-noise abilities across individuals . The speech auditory brainstem responses (S-ABRs) represent the features of frequency and timing in speech, music, and other stimuli, whereas cortical-evoked responses provide a more abstract representation of sound, thus providing an opportunity to examine auditory processing of these behaviorally relevant sounds , allowing for the objective assessment of biological processes underlying auditory function and auditory processing deficits not revealed by responses to clicks . The aim of this study was to evaluate the effect of background noise on speech auditory evoked responses in both normal-hearing (NH) individuals and those with sensorineural hearing loss (SNHL) and correlate these neurophysiological results with subjective measures. Fifty individuals with normal audiometric configurations in the frequency range 250–8000 Hz and 40 patients with bilateral symmetrical mild-to-moderate SNHL were included in this study. They were recruited from the Outpatient Clinic of the Audiology Unit, Ear, Nose, and Throat Department, Menoufia University Hospital. All patients approached agreed to participate in this study, and informed consent was obtained. All participants in this study were subjected to full audiological history, otological examination, and basic audiological evaluation. Patients were administered a self-reported questionnaire, the Speech, Spatial, and Qualities of Hearing Scale (SSQ) questionnaire, and speech perception in noise (SPIN) test at +10, 0 and −10 signal-to-noise ratio (SNR). S-ABR was recorded using the speech syllable/da/presented at 40 dBSL or at the most comfortable level for the study group at a rate of 11.1/s. The recording window was 64 ms with band-pass filtering from 150 to 1500 Hz and a gain of 50 kHz. The speech syllable was presented both in quiet condition and with ipsilateral noise presented at +10, 0, and − 10 SNR in alternating polarities with a signal averaging of 1024 sweeps. Cortical auditory evoked responses (CAEPs) were recorded using speech syllable/da/presented at 40 dBSL or at the most comfortable level for the study group at a rate of 0.5/s. The recording window was 512 ms with band-pass filtering from 1 to 30 Hz and a gain of 50 kHz. The speech syllable was presented both in quiet condition and with ipsilateral noise presented at +10, 0, and −10 SNR in alternating polarities with a signal averaging of 30 sweeps. Our statistical results showed no significant difference between the right and left ears in any of the patients as regards both latencies and amplitudes of all S-ABR waves. 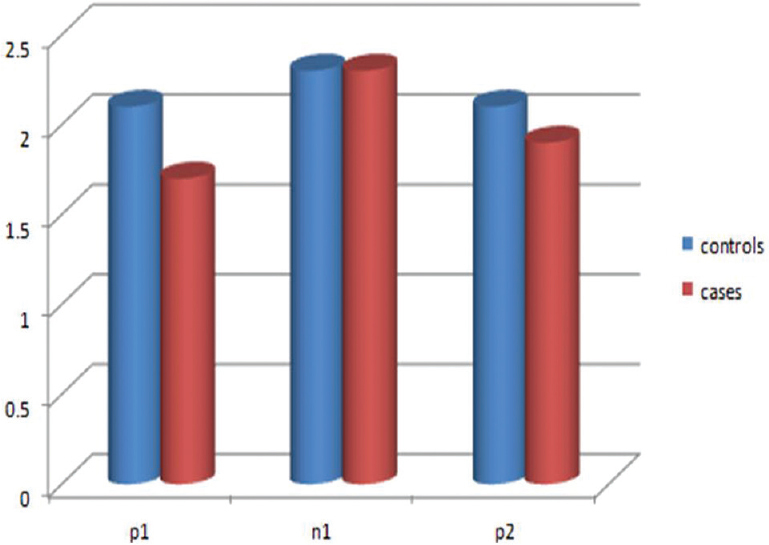 Hence, we did not segregate our results based on the ear [Table 1] and [Table 2]. Our results showed statistically significant differences between the control and study groups for absolute latencies of S-ABR waves: V, A, and O in quiet; V, D, and E at + 10 SNR [Figure 1]; V, C, D, and E at 0 SNR [Figure 2]; and C, D, E, and F at −10 SNR [Figure 3]. Figure 1: Latency of speech auditory brainstem response waves at +10 signal-to-noise ratio in the study and the control group. Figure 2: Latency of speech auditory brainstem response waves at 0 signal-to-noise ratio in the study and the control group. 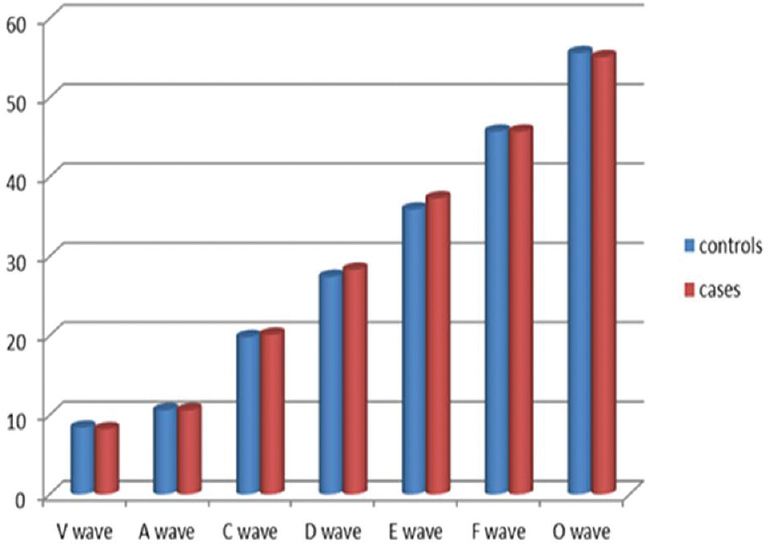 Figure 3: Latency of speech auditory brainstem response waves at -10 signal-to-noise ratio in the study and the control group. As regards amplitude of S-ABR waves, there were statistically significant differences between the control and the study group for all waves (V, A, C, D, E, F, and O) in quiet [Figure 4] and at different SNRs. 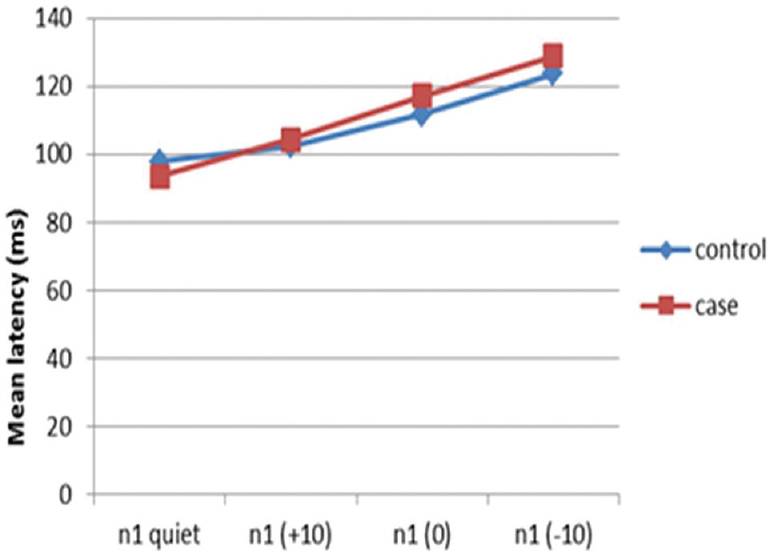 Figure 4: Amplitude of speech auditory brainstem response waves in quiet in the study and the control group. 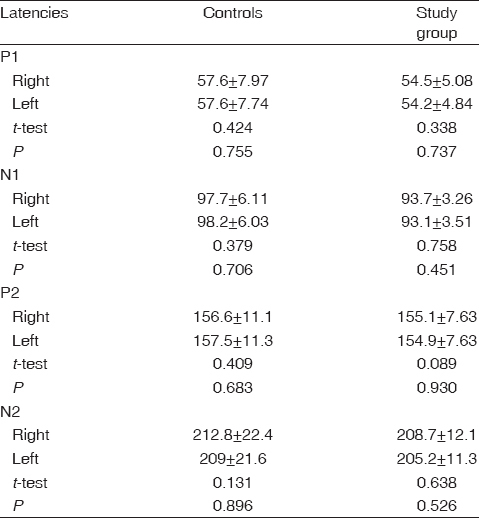 Volume average (VA) complex amplitude and area showed statistically significant differences between the control and the study group in all test conditions [Table 3] and [Table 4]. 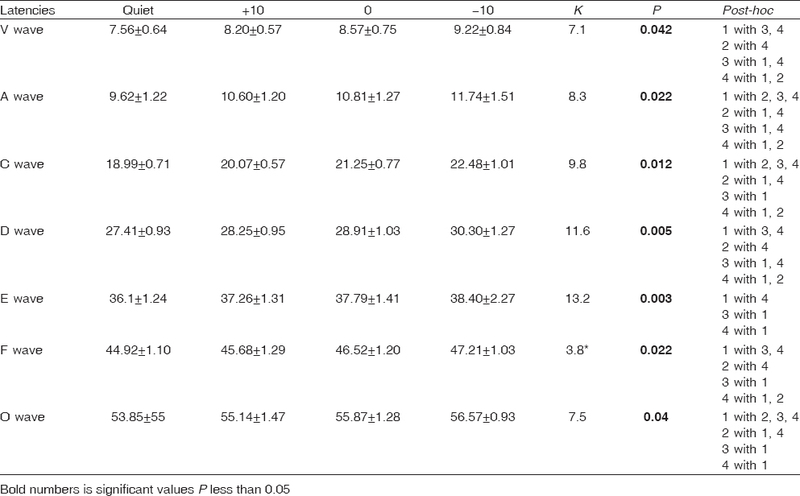 VA slope showed statistically significant differences between the control and study groups in quiet and at +10 and −10 SNR [Table 3] and [Table 4], and VA duration showed statistically significant differences between the control and study groups at −10 SNR [Table 4]. In NH, on comparing the latency of S-ABR waves in quiet and at different SNR, there were statistically significant differences for all S-ABR waves [Table 5], whereas on comparing amplitudes of S-ABR waves in quiet and at all SNR ratios, there were statistically significant differences for waves V, A, and F only. 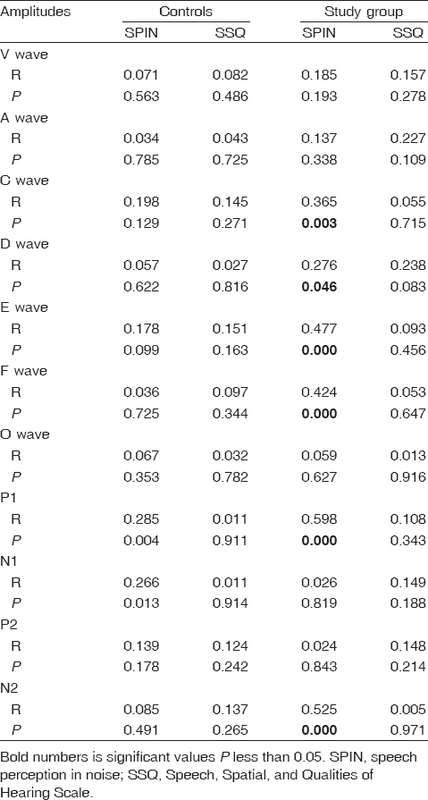 In SNHL, latencies [Table 6] and amplitudes of all waves showed statistically significant differences between quiet and different SNRs. Our statistical results showed no significant difference between the right and left ears in any of the patients as regards both latencies and amplitudes of all CAEPs waves. Thus, we did not segregate our results based on the ear [Table 7] and [Table 8]. Our results showed statistically significant differences between the control and study groups for absolute latencies of N1 in all test conditions [Figure 5] and latency of P1 in quiet condition only. Figure 5: Latency of wave N1 in quiet and at different signal.to.noise ratio in the study and the control group. As regards amplitude of CAEPs waves, there were statistically significant differences between the control and study groups for P1 amplitude at +10, 0, and −10 SNR and for P2 amplitudes at −10 SNR only [Figure 6]. 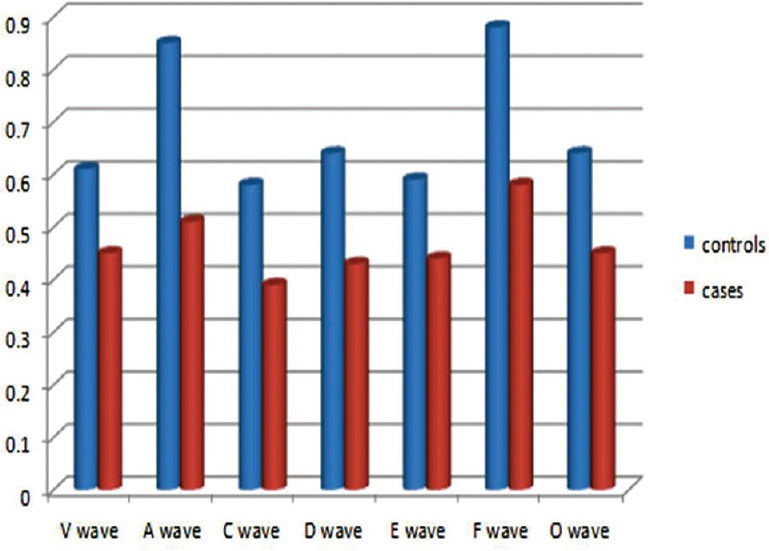 Figure 6: Amplitude of cortical auditory evoked response waves at -10 signal-to-noise ratio in the study and the control group. On comparing the latency and amplitude of CAEPs waves in quiet and at different SNR, there were statistically significant differences for all waves of CAEPs in both NH and SNHL. In the study group, there were significant negative correlations between the SPIN test and latency of wave A of S-ABR and waves P2 and N2 of CAEPs. Moreover, significant positive correlations between SPIN and amplitudes of S-ABR waves (V, C, D, E, F, and O) and CAEPs waves (P1 and N1) were found. In the control group, there was a significant positive correlation between SSQ and wave F amplitude, significant negative correlations between SSQ and latency of waves P1 and P2, and a significant negative correlation between the SPIN test and latency of waves P1, P2, and N2. In the study group, there was a significant positive correlation between SSQ and wave D amplitude, significant negative correlations between SPIN and latency of waves A and C of S-ABR and P2 and N2 of CAEPs, and significant correlations between SPIN and amplitude of waves V, C, E, F, and O of S-ABR and waves N1 and N2 of CAEPs. In the control group, there was a significant negative correlation between SSQ and latency of P1 and a significant positive correlation between the SPIN test and amplitude of waves P1 and N1. In the study group, there were significant negative correlations between the SPIN test and latency of waves A, D, F, and O of S-ABR and CAEPs waves P2 and N2, and significant positive correlations were found between the SPIN test and amplitude of waves C, D, E, and F of S-ABR and CAEP waves P1 and N2 [Table 9] and [Table 10]. Our results [Table 1] and [Table 2] are in agreement with the results of Vander Werff and Burns , who showed no significant differences in latency and amplitude for any of the S-ABR peaks between the left and right ears in young adults. The results of the current study showed that patients with SNHL had longer latencies and smaller amplitudes compared with those with NH in the different test conditions. These results are in agreement with those of Lipson , who reported that individuals with hearing loss have greater difficulty in noisy situations compared with NH counterparts, which is present even in individuals with only mild hearing loss as they experience increased listening effort in the presence of noise. In addition, Best et al. stated that individuals with hearing loss also have reduced release from masking; in other words, these individuals have a harder time moving and adjusting between noisy and quiet environments. The results of the current study showed that, in all test conditions (quiet, +10, 0, and − 10 SNR), patients with SNHL had longer latencies and smaller amplitudes compared with those with NH. These results confirmed that individuals with hearing loss have greater difficulty in noisy situations compared with NH counterparts. This is present even in individuals with only mild hearing loss; they experience increased listening effort in the presence of noise . In addition, individuals with hearing loss also have reduced release from masking ; in other words, these individuals have a harder time moving and adjusting between noisy and quiet environments. Our study showed that in quiet the SNHL group demonstrated delayed neural timing in the region corresponding to the conduction velocity (CV) formant transition (onset and offset, VA slope), but timing in the steady-state region remains unchanged (FFR). Detection of stimulus offsets and onsets contributes to the activation of duration-tuned neurons in the inferior colliculus and at higher levels of the auditory system ,. These duration-tuned neurons may act as spectrotemporal filters, providing the precise encoding necessary for understanding speech in noise , which may be affected in patients with SNHL. In quiet, our study also reported that the robustness of CV frequency representation decreases in SNHL, with a decline in the amplitude of all waves of the transient and sustained regions of CV (onset, FFR, offset, VA complex amplitude and area). With addition of noise, the brainstem encoding of/da/in SNHL showed affection of neural timing of sustained region of stimulus (wave F showed a significant difference in SNHL compared with NH only at −10 SNR), which become delayed together with onset wave, VA complex, and wave C. Moreover, robustness of syllable encoding decrease in SNHL than in NH. These results provide neural evidence for the finding that SNHL patients have trouble hearing in noise. The significant differences between groups for the transient and sustained areas of the response suggests that in noise neural encoding of the vowel and the consonant was more difficult for individuals with SNHL compared with those with NH. Our results are in agreement with the results of Carter , who showed that, in all three test conditions (quiet, +5, and +10 SNR), participants with unilateral hearing loss (UHL) had significantly longer latencies and smaller amplitudes compared with those with NH. However, our results are contradictory to the findings of Musser , who stated that, when comparing the NH and SNHL groups in his study, there were no significant differences in latency for measured waves. For magnitude, significant differences were noted between hearing groups for waves E and F in quiet condition and for wave A at +10 SNR condition. In the present study, ipsilateral noise degraded response morphology, prolonged latencies, and reduced amplitudes of all S-ABR waves for both groups with SNHL and NH. This demonstrated decreased neural precision in encoding the speech sound in noise. The results of the current study showed that the noise exhibited pan-auditory neural deficits (overall neural synchrony) affecting both the filter elements (transients) and also the source elements (FFR) of speech, affecting encoding of linguistic and paralinguistic information of speech. In NH, addition of noise at different SNRs caused delayed latencies of both transients (waves V, A, C, and O) and FFR (waves D, E, and F) with reduction in amplitudes of onset (V and A) and F wave only. Our result is in agreement with that by Parbery-Clark et al. , who showed that addition of background noise resulted in prolonged subcortical onset and transition response peaks. Noise diminished the amplitude of the subcortical onset response, but not the transition response peak amplitude. In SNHL, addition of noise at different SNRs caused delayed latencies and decreased amplitudes of both transients (waves V, A, C, and O) and FFR (waves D, E, and F). Our results are in agreement with the results of Carter , who indicated that there was a significant effect of listening condition (quiet vs. +10 and +5 SNR) for latency and amplitude of all S-ABR waves. The results are also in agreement with those of Musser , who showed significant differences in latency and amplitude for quiet versus noise at + 10 SNR for waves V, A, D, E, F, and O. Significant differences were not reported for wave C due to variability in wave presence and a reduced sample size. The N1 response is thought to reflect the time-varying aspects of a stimulus , such as the change from a consonant to a vowel  and voice onset time . Accurate cortical representations of this temporal acoustic information are important for speech perception , which appeared to be affected by SNHL. Moreover, in our study, latency of P1 showed a statistically significant differencebetween SNHL and NH in quiet only, whereas P1 amplitudes were significantly reduced at +10, 0, and −10 SNR. The reduction in P1 amplitude indicates that sensory representation, as indexed by P1 is affected by the addition of noise . It has been suggested that the P1 component reflects a nonspecific, preperceptual response to acoustic stimuli with P1 encoding the acoustic features of sound, such as frequency and timing ,. Our result is in agreement with that of Oates et al. 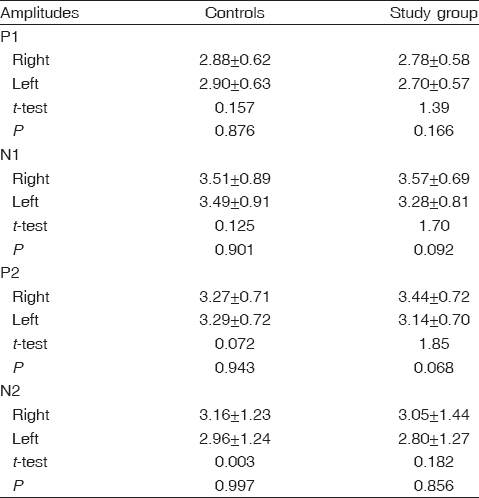 , who studied CAEPs in NH and SNHL in quiet and reported that amplitudes were lower for listeners with SNHL than for those with NH and that latencies were prolonged in SNHL relative to responses from NH individuals. However, our finding is in disagreement with the finding of Billings et al. , who revealed that hearing impairment effects were not present in CAEP data. The effect of noise can be seen in all waves of CAEPs – that is, with decreasing SNR response, latency increased and response amplitude decreased in both SNHL and NH. A noise-exclusion deficit may indicate a less efficient auditory system that is unable to dynamically adapt to challenging backgrounds . The fact that P1, N1, P2, and N2 components are all affected by SNR, despite their distinct neural generators, raises the possibility that the effects demonstrated here are reflective of subcortical processing that is propagated to higher levels of the auditory system . Our results are in agreement with those of Lucas , who showed that latencies increase and peak amplitudes decrease with decreasing SNR. In addition, he reported that the effect of SNR on peak latency was significant for all waves measured. Our results are in agreement with those of Billings et al. , as well, whose statistical results indicated that amplitudes increased and latencies decreased significantly as SNR increased; this was true for N1, P2, and N2 waves and P1 latency. However, our results are contradictory to the findings of Papesh et al. and Parbery-Clark et al. . Papesh et al. reported that the amplitudes of N1 and N2 peaks were often significantly enhanced in the presence of low-level background noise relative to quiet conditions, whereas P1 and P2 amplitudes were consistently reduced in noise. Parbery-Clark et al. investigated the effects of background noise on both subcortical-evoked and cortical-evoked responses. They showed that for cortical responses background noise resulted in later response timing for N1 and P2 peaks. The effect of noise on the magnitude of these peaks was not consistent, with N1 amplitude tending to increase and P2 amplitude being significantly reduced. In the present study, we tried to delineate the relationships between the neural encoding of speech in noise at subcortical and cortical levels and behavioral measures in NH and SNHL adults. We used the SSQ because we wanted to address individual self-perception of ability, which is what generally motivates someone to seek help for hearing difficulties. In addition, the SSQ is an approximation of overall, day-to-day suspected inhibitory interneurons performance, as opposed to a one-time test in a clinic . Our study showed that, with ipsilateral noise in NH individuals, SSQ correlated negatively with P1 latency at all SNR (+10, 0, and −10) and P2 latency at 0 SNR only. As regards S-ABR, SSQ was positively correlated with wave F amplitude in NH individuals and wave D amplitude in SNHL. 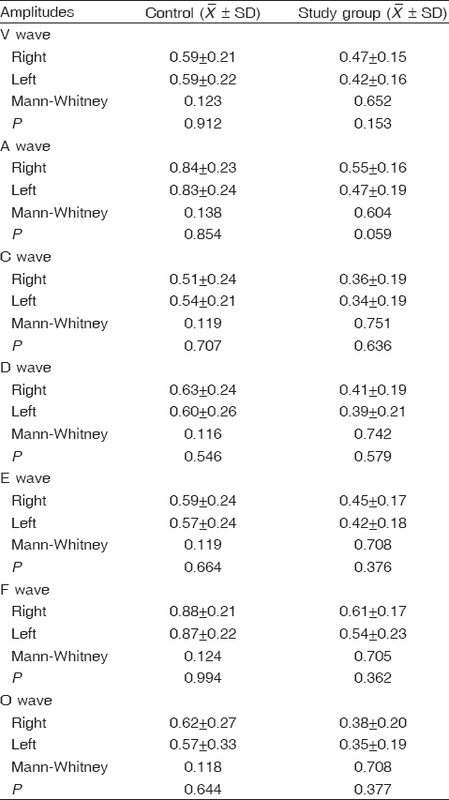 In other words, higher scores for SSQ were related to larger amplitudes of wave F in NH individuals and wave D in SNHL patients, where waves F and D represent the FFR of S-ABR, which encodes the paralinguistic information of the speech that conveys the intention, or how the message is expressed in both NH and those with SNHL. No other wave components of S-ABR were significantly correlated with SSQ. Moreover, our study reported that better SPIN performance in NH correlated with earlier P1, P2, and N2 peak response timing and correlated with larger P1 and N1 peak response amplitude. However, in SNHL, better SPIN performance correlated with earlier peak response timing of waves P2 and N2, and larger peak response amplitude of waves P1, N1, and N2. In the current study, better SPIN performance in SNHL correlated with earlier response timing and larger response amplitude of S-ABR onset, transition, FFR, and offset peaks. Carter  showed that, when including all participants of his study (NH and UHL), there were two correlations identified between the S-ABR and speech recognition measures. CNC words in noise scores were correlated positively with the amplitude of wave V and the fundamental frequency. In other words, higher scores for central nervous system (CNC) words in noise were related to larger amplitudes of wave V and the fundamental frequency. No other wave components were significantly correlated with CNC word scores in noise condition. Parbery-Clark et al. , who conducted a study on NH adults, found that in the noise condition better speech-in-noise performance using the hearing in noise test (HINT) test correlated with earlier onset and earlier transition peak response timing of S-ABR. No relationships were observed between any measure of brainstem encoding of speech in quiet and speech-in-noise perception. Parbery-Clark et al. also reported that, in noise condition, N1 amplitude positively correlated with SPIN, such that better performance on HINT was associated with greater N1 amplitude. Other cortical measures in noise, N1 and P2 latency and P2 amplitude, were not correlated with speech-in-noise perception. Likewise, no relationships were found between cortical measures in quiet and HINT. Anderson et al. reported in their study, which included 111 participants with hearing levels ranging from NH to moderate hearing loss, a significant correlation between SSQ and monaural in quiet S-ABR offset latency, and monaural and binaural morphology. No significant correlations were noted between the SSQ and the binaural-in-noise S-ABR variables. The relationship between measures of subcortical and cortical encoding and speech-in-noise perception suggests that these factors operate in an integrated manner. These electrophysiological events offer a system-wide view of the key neural facets underlying the perception of speech in noise . Noise exhibited neural deficits of S-ABR affecting the filter elements (transients) and the source elements (FFR) of speech, thus affecting encoding of both linguistic and paralinguistic information of speech in both SNHL and NH. The effect of noise can be seen in the overall waves of CAEPs – that is, response latency increased and response amplitude decreased with decreasing SNR in both SNHL and NH. We report a relationship between specific aspects of neural encoding of sound at subcortical and cortical levels that directly relate to speech-in-noise perceptual ability, where better SPIN performance correlated with earlier response timing and larger response amplitude of all S-ABR waves both transient and sustained components. Moreover, better SPIN performance correlated with earlier peak response timing of waves P2 and N2 and larger peak response amplitude of waves P1, N1, and N2. Darwin CJ. Listening to speech in the presence of other sounds. Philos Trans R Soc Lond B Biol Sci 2008; 363:1011–1021. Getzmann S, Lewald J, Falkenstein M. Using auditory pre-information to solve the cocktail-party problem: electrophysiological evidence for age specific differences. Front Neurosci 2014; 8:413. Billings CJ, Mcmillan GP, Penman TM, Gille S. Predicting perception in noise using cortical auditory evoked potentials. J Assoc Res Otolaryngol 2013; 14:891–903. Anderson S, Kraus N. Objective neural indices of speech-in-noise perception. Trends Amplif 2010; 14:73–83. Hornickel J, Anderson S, Skoe E, Yi H, Kraus N. Subcortical representation of speech fine structure relates to reading ability. Neuro Report 2012; 23:6–9. Vander Werff KR, Burns KS. Brain stem responses to speech in younger and older adults. Ear Hearing 2011; 32:168–180. Lipson S. The relation between speech recognition in noise and the speech-evoked brainstem response in normal-hearing and hearing-impaired individuals. Independent Studies and Capstones; 2013;; Program in Audiology and Communication Sciences, Washington University School of Medicine; Paper 640. Available from http://digitalcommons.wustl.edu/pacs_capstones/640. [Last accessed on 2015 May 07]. Best V, Mason C, Kidd G. Spatial release from masking in normally hearing and hearing-impaired listeners as a function of the temporal overlap of competing talkers. J Acoust Soc Am 2011; 129:1616–1625. Brand A, Urban R, Grothe B. Duration tuning in the mouse auditory midbrain. J Neurophysiol 2000; 84:1790–1799. Faure PA, Fremouw T, Casseday JH, Covey E. Temporal masking reveals properties of sound evoked inhibition in duration-tuned neurons of the inferior colliculus. J Neurosci 2003; 23:3052–3065. Sayegh R, Aubie B, Faure P. Duration tuning in the auditory midbrain of echolocating and non-echolocating vertebrates. J Comp Physiol A Neuroethol Sens Neural Behav Physiol 2011; 197:571–583. Carter ME. Speech-evoked auditory brainstem response in children with unilateral hearing loss. Independent Studies and Capstones; 2014; Program in Audiology and Communication Sciences, Washington University School of Medicine; Paper 664. Available from: http://digitalcommons.wustl.edu/pacs_capstones. [Last access 2015 Mar 06]. Musser KE. Effect of unilateral hearing loss on the speech- evoked auditory brainstem response in the presence of noise Independent Studies and Capstones; 2011; Program in Audiology and Communication Sciences, Washington University School of Medicine; Paper 602. Parbery-Clark A, Marmel F, Bair J, Kraus N. What subcortical–cortical relationships tell us about processing speech in noise. Eur J Neurosci 2011; 33:549–557. Näätänen R, Picton T. The N1 wave of the human electric and magnetic response to sound: a review and an analysis of the component structure. Psychophysiology 1987; 24:375–425. Tremblay KL, Kalstein L, Billings CJ, Souza PE. 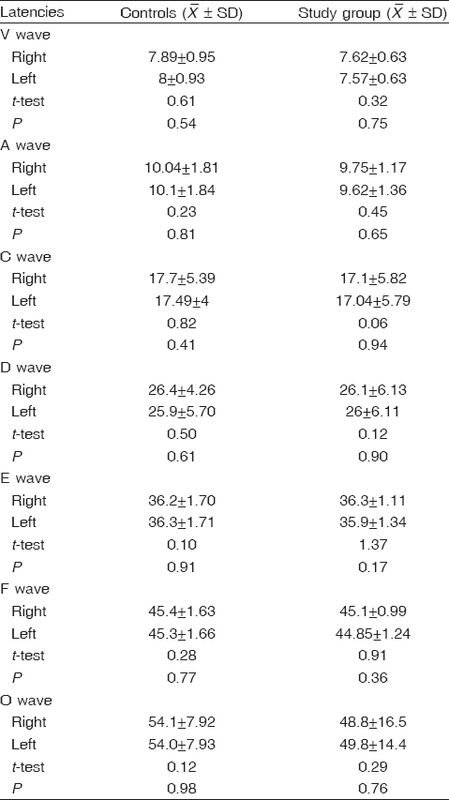 The neural representation of consonant–vowel transitions in adults who wear hearing aids. Trends Amplif 2006; 10:155–162. Hoonhorst I, Serniclaes W, Collet G, Colin C, Markessis E, Radeau M, Deltenre P. N1b and Na subcomponents of the N100 long latency auditory evoked-potential: neurophysiological correlates of voicing in French-speaking subjects. Clin Neurophysiol 2009; 120:897–903. Tzounopoulos T, Kraus N. Learning to encode timing: mechanisms of plasticity in the auditory brainstem. Neuron 2009; 62:463–469. Sharma A, Dorman M, Spahr A. A sensitive period for the development of the central auditory system in children with cochlear implants: implications for age of implantation. Ear Hear 2002; 23:532–539. Shtyrov Y, Kujala T, Ahveninen J, Tervaniemi M, Alku P, Ilmoniemi RJ, Näätänen R. Background acoustic noise and the hemispheric lateralization of speech processing in the human brain: magnetic mismatch negativity study. Neurosci Lett 1998; 251:141–144. Ceponiene R, Alku P, Westerfield M, Torki M, Townsend J. ERPs differentiate syllable and nonphonetic sound processing in children and adults. Psychophysiology 2005; 42:391–406. Oates PA, Kurtzberg D, Stapells DR. 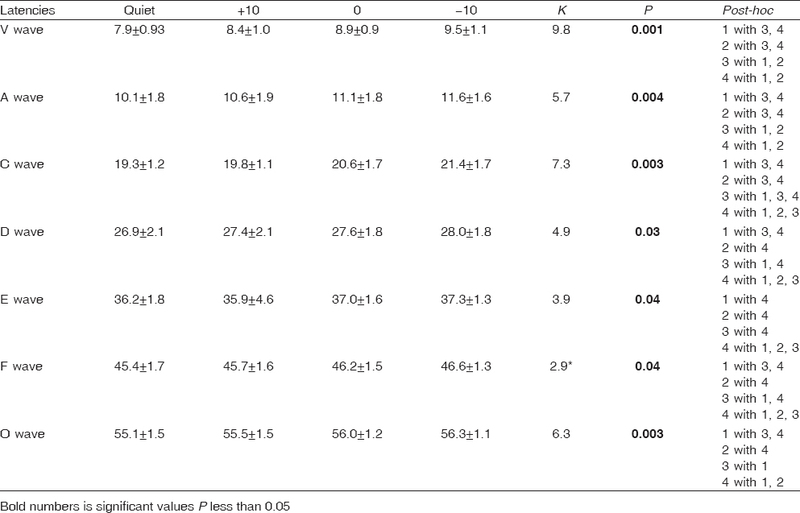 Effects of sensorineural hearing loss on cortical event-related potential and behavioral measures of speech–sound processing. Ear Hear 2002; 23:399–415. Billings CJ, Penman TM, McMillan GP, Ellis EM. Electrophysiology and perception of speech in noise in older listeners: effects of hearing impairment and age. Ear Hearing 2015; 36: 710–722. Billings C, Tremblay K, Stecker G, Tolin, W. Human evoked cortical activity to signal-to-noise ratio and absolute signal level. Hear Res 2009; 254:15–24. Baltzell LS, Billings CJ. 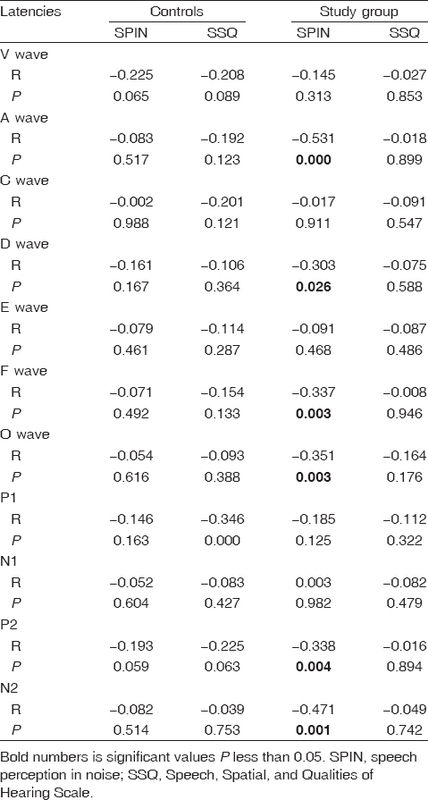 Sensitivity of offset and onset cortical auditory evoked potentials to signals in noise. Clin Neurophysiol 2014; 125:370–380. Papesh MA, Billings CJ, Baltzell LS. Background noise can enhance cortical auditory evoked potentials under certain conditions. Clin Neurophysiol 2015; 126:1319–1330. Anderson S, White T, Parbery A, Kraus N. Reversal of age-related neural timing delays with training. Proc Natl Acad Sci USA 2013; 110:4357–4362.